Just before I wrote the post on "Name your price", I had read the post on the Tomedes blog with which they announced their new service. I also left a comment there: "Why not go the whole hog and call your new service “screw the translator”, instead?" I'm sorry that you see it that way. “Tomedes name your price” keeps having the same benefits Tomedes brings to translators today. We keep getting excellent feedback from professional translators. You are more than welcome to register and see for yourself. Tomedes does not have a fixed rate. 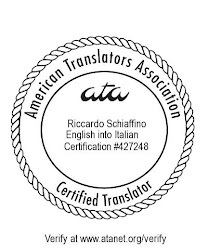 Any translator can decide which translations he would like to take and to set his rate based on his availability and based on random sentences from the source document we let him/her see. We never compromise on quality and carry out an advanced quality assurance system ensuring we work only with professional translators. I'm sure Ofer is sincere in thinking so, but actions speak louder than words: the new scheme is a typical example of a reverse auction. A tool used in industrial business-to-business procurement. It is a type of auction in which the role of the buyer and seller are reversed, with the primary objective to drive purchase prices downward. There have been companies (outside the translation field) that have expanded their business by bidding in reverse auctions (See Inc., May 2007; Reverse Auctions – A supplier's survival guide: an article quoted in the Wikipedia's entry). But to use a reverse auction successfully, businesses (and professionals) need to be highly knowledgeable about their market, the details of the job, and, above all, their own costs. Otherwise they risk all too easily to lose money on the projects they win. In other words, they need to have finely honed business skills, something that most translators conspicuously lack. The result of a reverse translation auction as described is easy to foresee: The customer receives a quote (which, remember, is calculated considering the lowest bid estimated for the project), and names a lower price. Some translator accepts the lower rate, and the translation is delivered to the customer. Next time, the customer again asks for a quote, and this time, besides the quoted price, he also knows that last time he succeeded in buying the translation for a lower price. So he again "Names his price", even lower than last time. This is a slippery slope where soon prices can be driven down to mere pittances, to the detriment of all. I completely agree. This is a very old revolutionary trick that keeps translators underpaid and humiliated, whereas the customer receive target text of questionable quality.